A super-fit mum who undertook gruelling workouts up until she was 40 WEEKS pregnant has hit back at trolls who slammed her for ‘being vain’ and ‘endangering’ her baby. 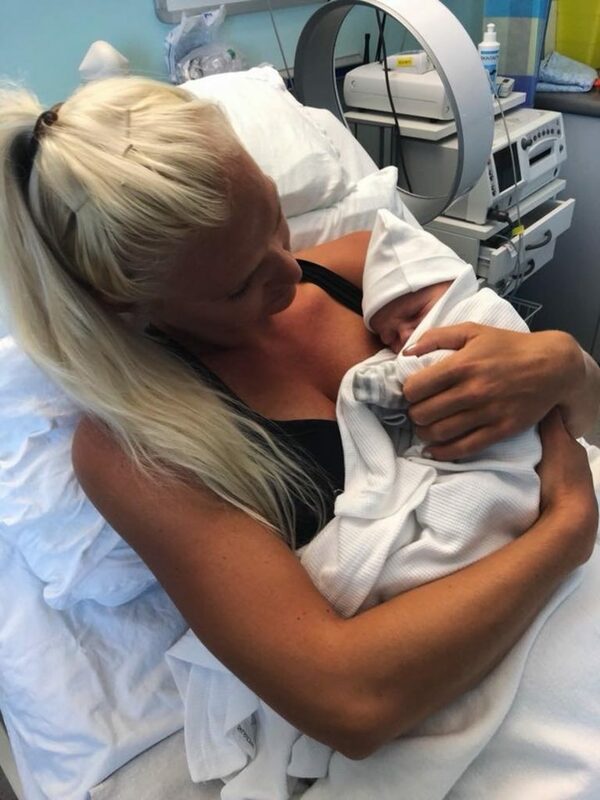 Fitness coach Sarah Holden defied midwives who told her to ditch the weights and exercised six days a week when expecting little Kayson Arthur Mills earlier this year. But Sarah, who has been training clients for five years, was stunned when she received negative comments on social media blasting her for ‘extending body shaming to pregnant women’ and putting her unborn child at risk. The 5ft 9in PureGym PT had undertaken extensive research in prenatal exercise while training pregnant clients so knew how to train safely and was merely taking pictures and video to document her pregnancy journey. Nine-week-old Kayson, who hit every growth milestone when Sarah went for check-ups, was born at 7lb 2oz on July 5 and is a healthy, happy little boy. Sarah, 26, is now speaking out to ensure other mums-to-be experiencing no health problems don’t feel pressured to ditch the gym when they fall pregnant. Mum-of-one Sarah from Stirling, Scotland, said: “People reacted differently when they found out I was pregnant and still working out. “Not so much at the beginning because I wasn’t really showing but at the 25-week point then, more than ever, people would make comments if they saw me exercising. “If I was carrying weights and putting them away a lot of people would say ‘you shouldn’t be lifting that’ but not offering to help, just commenting. “One guy even came up to me on the gym floor and said ‘you shouldn’t be working out, you could harm the baby’. “I was pregnant, not powerless. He didn’t know what he was talking about, so I just told him that I know my body and it wasn’t really his business. “I tried to train every day, with one rest day, but didn’t put any pressure on myself. Instead of my usual 90-minute training regime I would see how a 30-minute session would go. 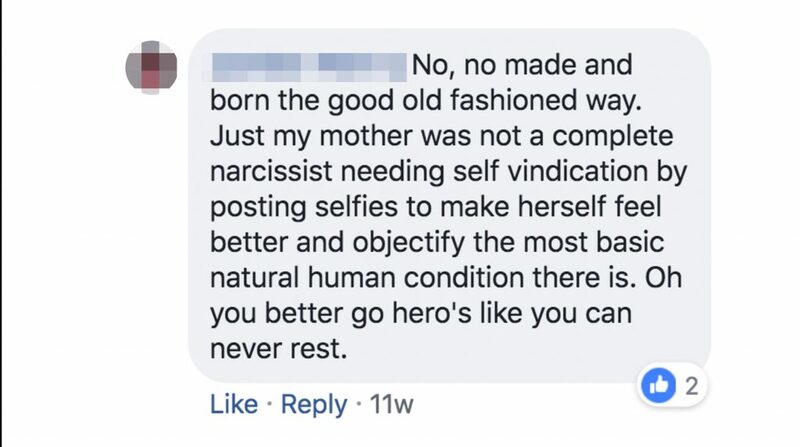 MERCURY PRESS: Pictured: A Facebook comment shaming Sarah Holden for working out while pregnant. Sarah, who works at the Stirling branch of the gym chain, adapted her routines and swapped her usual 100kg deadlifting weights for 40kg ones and her 16kg kettlebells for 12kg ones. Sarah said: “I changed the type of exercise I was doing and used different weights for deadlifts and squats including using my own body weight. “I would never have done anything that would harm my baby. “When I went for my health visits all my scans were perfect in terms of growth. “Some said he was going to be tiny because of my exercise regime but he was right on track for weight and size and there were no problems at all. “Obviously everyone is different and there can be health problems during pregnancy, and if you experience this you can’t train. Sarah found out she was pregnant with personal trainer partner of four years Darryll Mills, 36, when she was six weeks along. Sarah said: “It was quite early when I found out I was pregnant. I had a feeling and then took five pregnancy tests to confirm it – we were thrilled. “It was a little hard adjusting at the beginning of my pregnancy as I always want to push myself at the gym. I was obviously a lot more tired and couldn’t train as intensely. “I also had really bad morning sickness, it was like feeling hungover for nine months. “At my eight-week scan I was told that I wasn’t to use weights by the midwife, I just disagreed and said I would be. 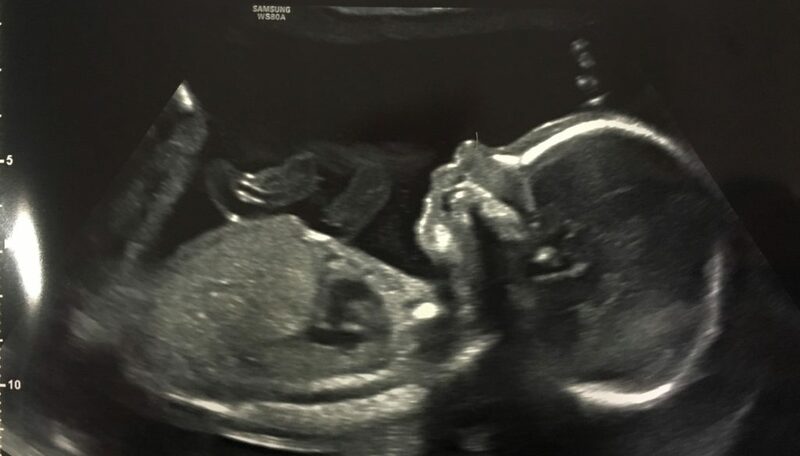 MERCURY PRESS: Pictured: Sarah Holdens 20 week baby scan. When PureGym’s Facebook page shared one of her pregnancy photos with the hashtag #fitpregnancy in June the account was flooded with comments – both positive and negative. Sarah said: “I received the worst comments on social media, some were really stupid. “The weights I was using might be heavy for people commenting on my posts, but for me they were a lot lighter. MERCURY PRESS: Pictured: Sarah Holden three days before her due date. “People didn’t understand why I was carrying on. I got told ‘you’re so vain and care more about what you look like than the health of your baby’. Sarah claims working out during pregnancy helped her sustain her energy levels during the speedy labour. Sarah said: “I’d been in labour and walking around for two hours, which speeds it up, but from getting to the hospital to having Kayson it was less than an hour, it was really quick. Sarah said Kayson ‘means everything’ to her and is a strong little boy who doesn’t cry often. Sarah said: “He’s so alert, really active but really calm. He doesn’t cry much at all unless he’s hungry which is fair enough. “At two days he was holding his head up, he’s really strong. MERCURY PRESS: Pictured: Sarah Holden when 15 weeks pregnant. “I don’t know if it’s anything to do with my exercising while pregnant, but everyone comments on how strong he is. “He has no problems with his health and is 100 per cent a healthy baby. Sarah took four weeks off to recover but then started a little bit of light exercise and has starting building up from there. Sarah said: “You’re supposed to wait six weeks before starting exercising again but I know my own body. “The first time I went back to the gym was the first time I left him with Darryll which I found difficult at first, but it’s important to make time for yourself away from the baby as well. “It was nice to have some ‘me’ time and be able to just think about the exercise I was doing. “I was a little bit nervous at first but I’m taking it really easy. “I just want to tell expectant mums not to be scared to continue with their fitness regime and not let what anyone says or thinks affect them. PureGym’s social media manager Emily Rajch said: “Sarah is a huge part of PureGym social media. “I selected her to become a PureGym Insider due to her incredibly inspiring content on Instagram but also the way she handles herself when it comes to people’s comments on social media platforms regarding her pregnancy workouts. “We have a huge community at PureGym and so many people support Sarah’s journey when we post her content. MERCURY PRESS: Pictured: Sarah Holden on holiday in Mexico in 2017. “She is a highly qualified PT and only encourages sensible advice to suit each individual. “We even have medical professionals sharing their support for Sarah on Facebook. • The more active and fit you are during pregnancy, the easier it will be for you to adapt to your changing shape and weight gain. It will also help you to cope with labour and get back into shape after the birth. • Keep up your normal daily physical activity or exercise (sport, running, yoga, dancing, or even walking to the shops and back) for as long as you feel comfortable. • Exercise is not dangerous for your baby – there is some evidence that active women are less likely to experience problems in later pregnancy and labour. • Don’t exhaust yourself. You may need to slow down as your pregnancy progresses or if your maternity team advises you to. If in doubt, consult your maternity team. • As a general rule, you should be able to hold a conversation as you exercise when pregnant. If you become breathless as you talk, then you’re probably exercising too strenuously. • If you weren’t active before you got pregnant, don’t suddenly take up strenuous exercise. If you start an aerobic exercise programme (such as running, swimming, cycling, walking or aerobics classes), tell the instructor that you’re pregnant and begin with no more than 15 minutes of continuous exercise, three times a week. Increase this gradually to at least four 30-minute sessions a week. Boxing-mad mum-to-be still in the ring with huge bump at nine months pregnant!